It is a good idea to ride Fosjoas intelligent self-balancing scooters. They are green and intelligent transport tools in the new age. Fosjoas intelligent unicycles may bring people more convenient and easier Christmas shopping experience. Fosjoas electric intelligent unicycles have been rolled out by the innovative enterprise, Moben Intl Co., Limited. They are eco-friendly and portable. Fosjoas electric unicycles are driven by the green resource, electricity. They have adopted the original Japan-made lithium batteries, which are safer and greener than ordinary ones. They don't cause air pollutions to the environment. And they have so small body size that they can be put into bags and boxes by users. When people go out to do Christmas shopping, they can put Fosjoas unicycles in the cars. Once they arrive at the shopping malls, Fosjoas scooters can immediately become their special vehicles. Users can ride the unicycles to shop, rather than walking. Most people feel exhausted after walking for long time. But Fosjoas scooters make their trips easier and faster. What's more, Fosjoas single-wheeled electric scooter are equipped with smart chips inside. The chips have used aerospace attitude control theory, fuzzy software algorithm and gyroscope system to realize self-balancing. Thus, it isn't difficult for users to learn riding Fosjoas unicycles. They can control the electric scooters by twisting their bodies. With Fosjoas intelligent unicycles, users' shopping experience will be freer and more interesting. If Thanksgiving Day is coming, can Christmas be far behind? 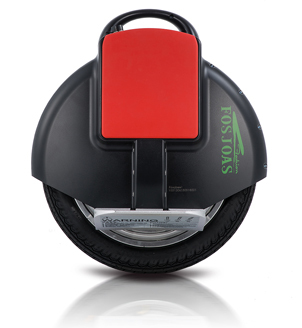 Come on and take a Fosjoas electric unicycle to prepare for the Christmas shopping.